What On Earth? 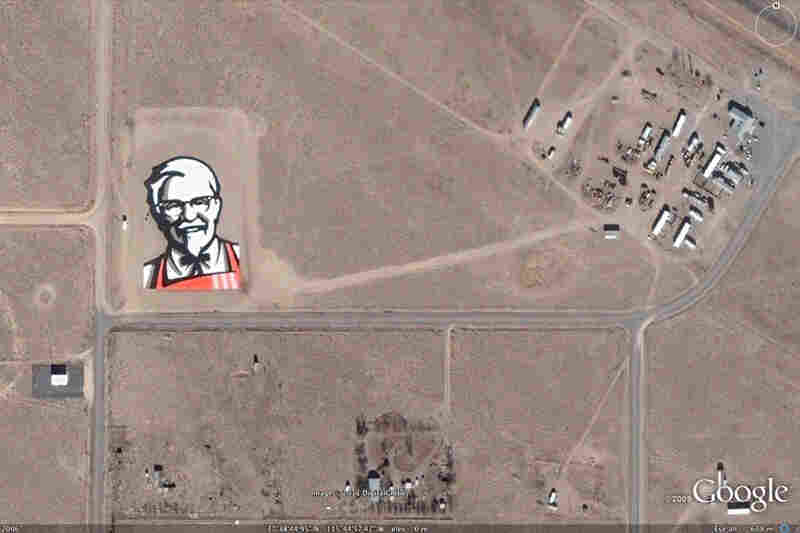 Art And Ads That Can Be Seen From Space : The Picture Show Unusual views from Google Earth show what could be the next phase in marketing. 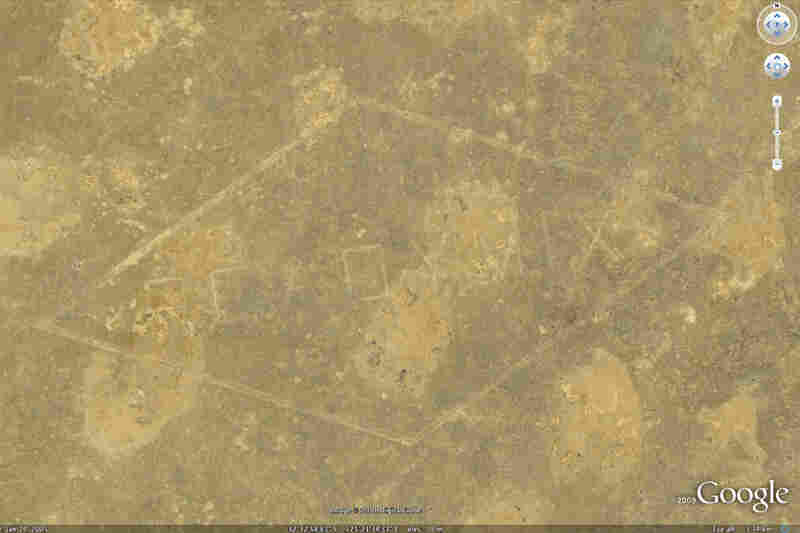 The KFC Colonel wasn't the first "astrovertisement"; this Readymix logo in the Australian desert is almost 2 miles across, and it's been there since 1965. 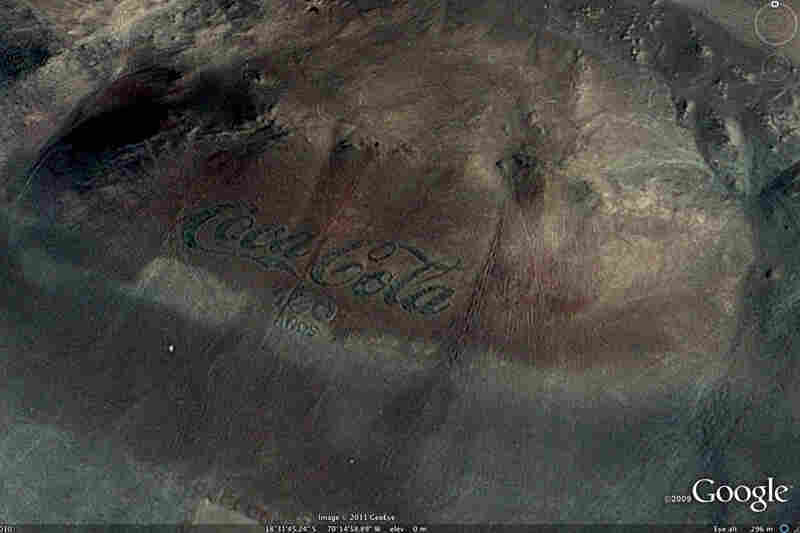 In the desert outside of Arica, Chile, lies a 460-foot-long Coca-Cola logo, made entirely of — you guessed it (or did you?) — empty Coke bottles; 70,000 of them.The text beneath the logo reads "100 años," made to celebrate the company's 100th anniversary in 1986. This year, the logo was updated to read 125 años, but that change may not be made to Google Maps for some time. 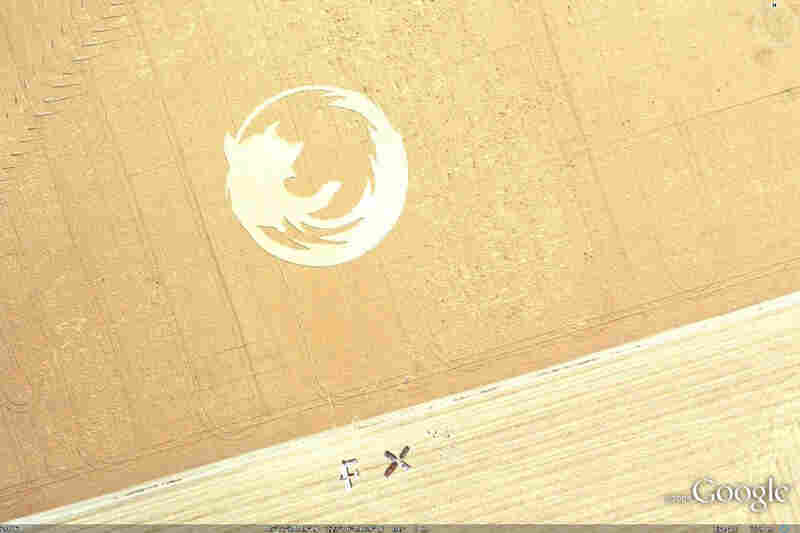 This 220-foot-wide icon was created by the Oregon State University Linux Users Group to celebrate the launch of Firefox version 2. According to their website, it took a team of 12 people to stomp down the oats overnight. Just south of the logo you can see that they've also arranged their vehicles and bodies to spell out "FX2." This 600-foot-long jellyfish popped up overnight in a barley field in Oxfordshire, England, in 2009. 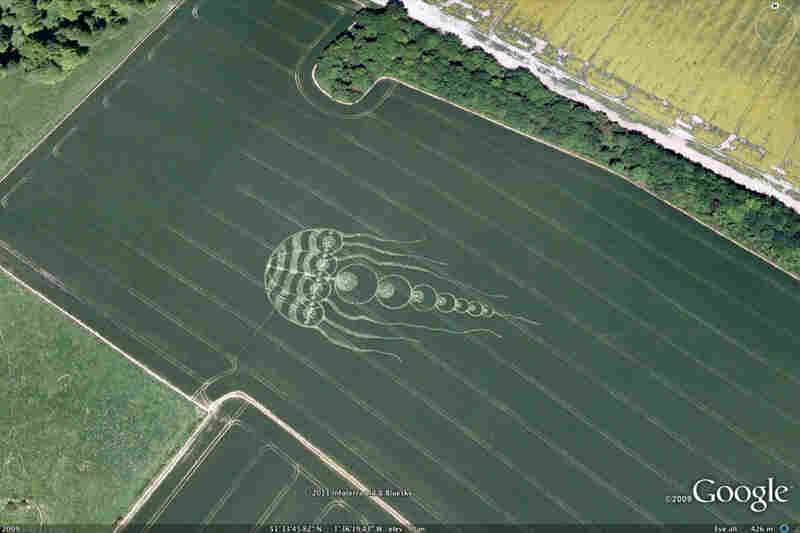 Although that crop has long since been harvested, the jellyfish is immortalized (at least for now) in Google Maps. Neighboring Wiltshire is famous for its abundance of crop circles, which has become a valuable part of the tourism industry there. Every year, from April to August, dozens of patterns appear on farms throughout the county. 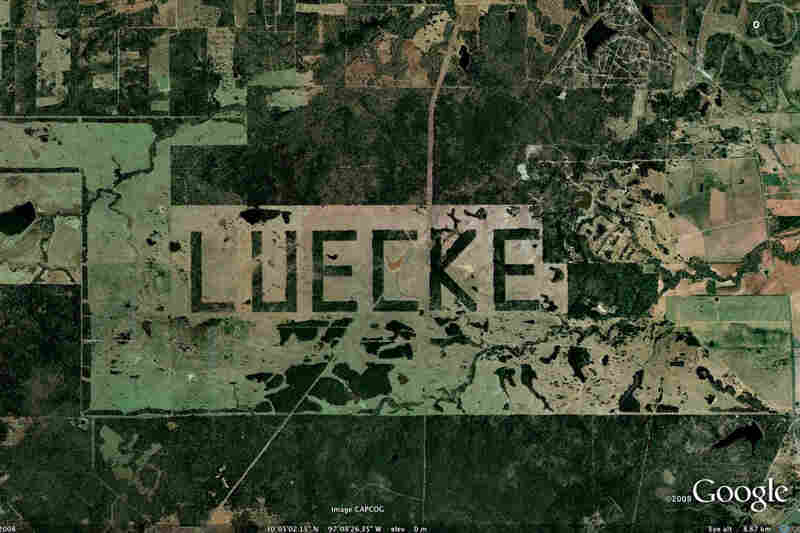 According to NASA, this forest just outside Austin, Texas, was "selectively cleared in order to spell the landowner's name 'LUECKE' with the remaining trees. 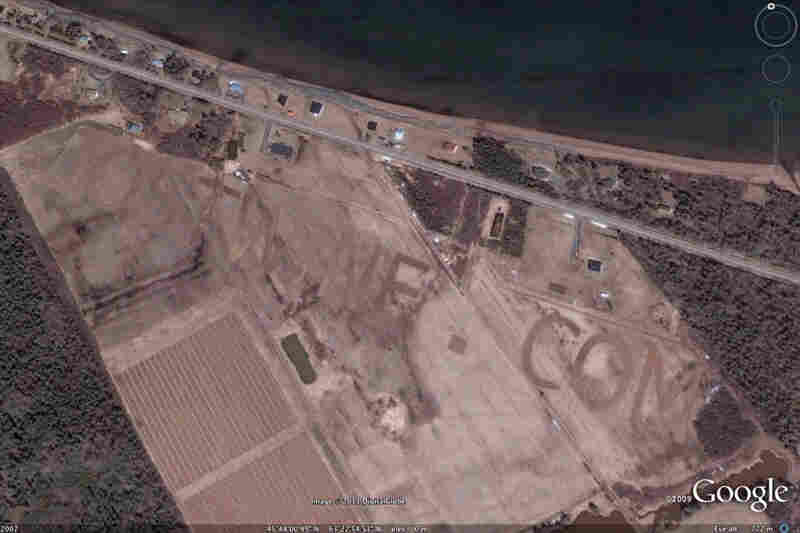 According to local surveyors ... the plan was to create letters that were 3100 (by) 1700 ft."So why does NASA care? Their Image Science and Analysis Lab proposed the landmark as a key to evaluating the spatial resolution of photos taken by astronauts. A vineyard on the coast of Nova Scotia uses ther fields to do more than grow grapes – they also advertise their website. Mundi Man, in Australia's Mundi Mundi Plains, is the work of artist Ando who, on his website, claims, "I have done hundreds of paintings of landscapes on canvas but this is the first time I have used the landscape as my canvas! "The image of a "stockman," or cowboy, pays homage to the pioneers of the Australian Outback. He's a little hard to see here, but the following image is enhanced to give you a better idea of what he looks like. 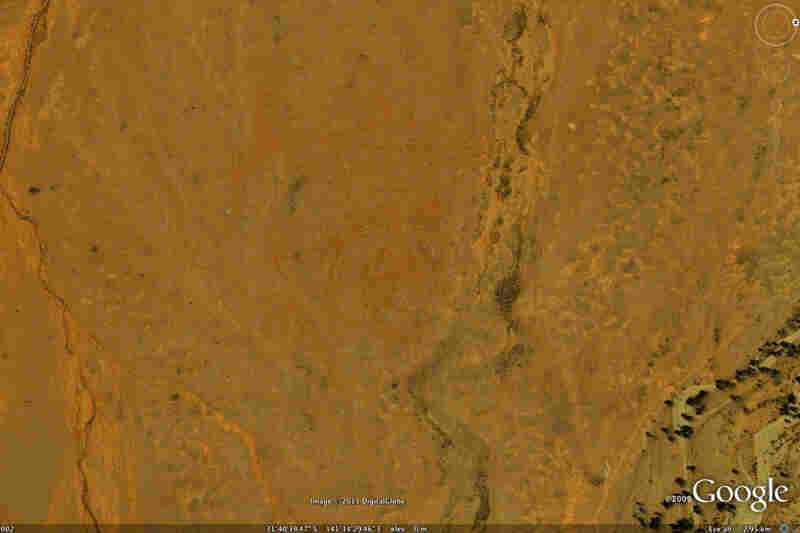 Mundi Man covers 1.5 square miles of Australian desert, making it arguably the world's largest work of art. His smile alone is as wide as the Empire State Building is tall. Written in the sands of the Atacama Desert, Chile, are the words "ni pena ni miedo" which translate more or less as "No shame nor fear." The 2-mile-long poem is the work of Raul Zurita, a poet who suffered abuse under Augusto Pinochet's dictatorship. If you're having trouble seeing the bulldozed words, perhaps the following digital manipulation of the image might help. In the preface to the 2009 edition of his book "Purgatory", Zurita writes, "Imagining these poems occupying landscapes was my intimate form of resistance, of not giving up, of not dying in the midst of abuse and confinement. When faced with the horror, we had to respond with art that was stronger and more vast than the pain and damage inflicted on us." With advertisements plastered on any surface one can imagine, is the surface of the Earth the next frontier for marketers? KFC claims in a press release that their giant portrait of Colonel Sanders, built in 2006, is "the world's first brand visible from outer space." 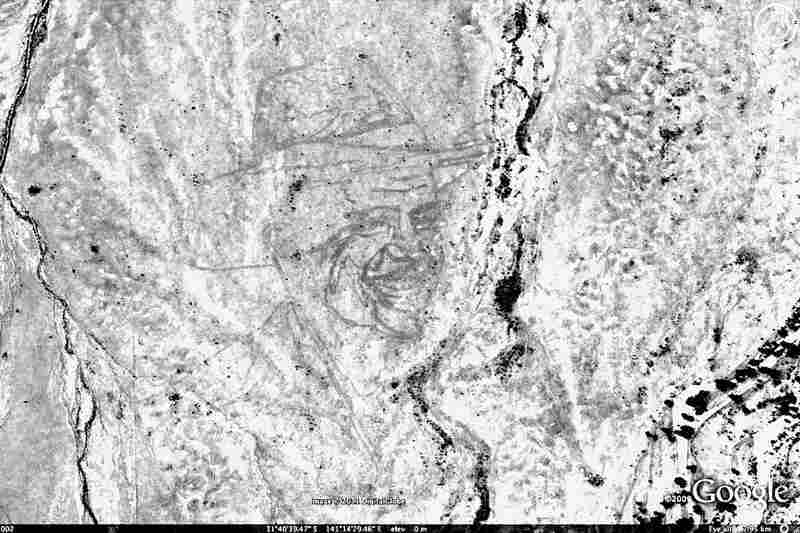 But, as Alex and James Turnbull of the blog Google Sightseeing point out, the oldest "astrovertisement" is actually a Readymix logo that was carved into the Australian desert in 1965. The Turnbull brothers started Google Sightseeing (which is not officially affiliated with Google) in 2005, shortly after Google Maps was launched. In an e-mail, Alex writes that they started the blog, "as a place we could share the amazing things we were finding." 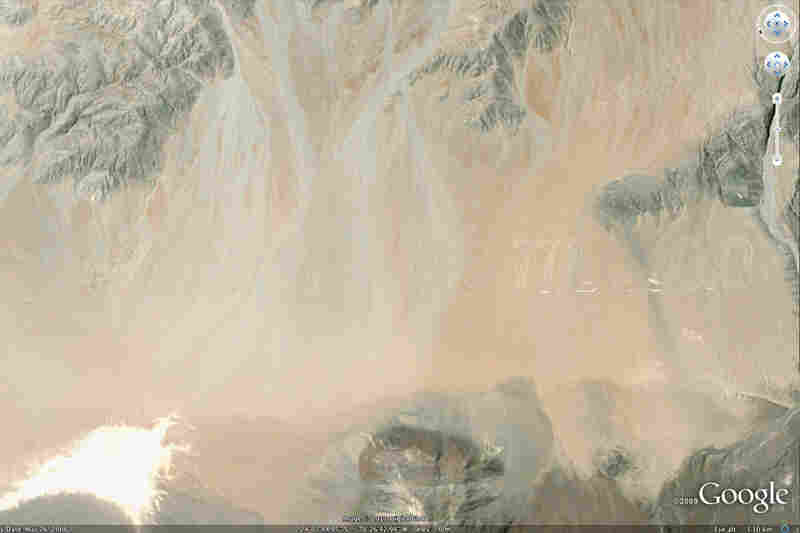 The site receives many submissions from readers who turn up all sorts of discoveries in their satellite explorations. "New things are discovered all the time!" writes Alex, "From advertising stunts, to new meteor impact craters, to whole hidden military installations." Google Maps is not updated in real time, so some older artifacts are represented that may no longer exist, while recently updated patches of the map may reveal new pieces of art or advertisement. Have you spent much time searching the Earth's surface? What have you found?